Enjoy a Flor de Las Antillas cigar from My Father Cigars (Cigar Aficionado’s #1 cigar for 2012). These cigars have a gentle, rounded box press and a beautiful and evenly colored wrapper. The smokes are delicious from the first puff, with notes of nutmeg, white pepper and just enough strength without being overpowering. They are hard to put down. They are classics, 96-point smokes on Cigar Aficionado’s 100-point scale. Flor De Cana: Flor De Cana 18yr- This stunning amber rum is full-bodied, with a rich complexity of flavors and a smooth finish that stays with you, long after the swallow. 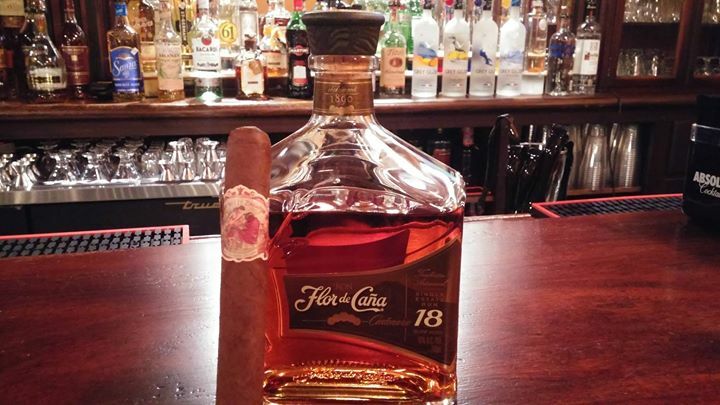 Flor de Caña Centenario 18 has almost two decades in the making, and you can taste the craftsmanship and tradition in every drop. Zaya: Zaya Gran Reserva’s proprietary recipe is hand blended with 3-5 rums aged in oak barrels for no less than 12 years. Creating a truly alluring and sophisticated rum that is sure to elevate the evening. Don Q: Don Q Gran Anejo- Aging mellows a spirit. It also brings out new flavors and aromas. Our Gran Añejo contains a blend of rums aged between 3 and 12 years and Solera rums aged up to 20 years, creating a balance between sweet and dry that you won’t get in other spirits. Drink it on the rocks, drink it neat. If you must, add a splash of ginger (we won’t tell anyone). Drink it slow, and share a moment with your friends. Ballast Point Three Sheets Barrel Aged: They say everything gets better with age. This rum is no exception. We age our white rum like a bourbon for two years in virgin American oak barrels, introducing hints of toffee and caramel that give way to flavors of vanilla and tobacco. This rum can hold its own in any whiskey cocktail, but we like it served neat. And sipped slowly.